The average readership of thegrambler.com is usually something over 300 per week. Not a particularly high readership level, but it is gratifying that so many of you read and enjoy the world’s greatest ill-informed blog. Sometimes the figure is considerably higher; sometimes considerably lower. It seems to fluctuate depending on whatever title the week’s edition is given. For example, the week that Bruce Springsteen was mentioned in the title there were 600 views; the week Adele was highlighted? 64. Poor Adele. Even Bruce Forsyth managed 70 hits. Surprisingly, the Queen only reached 79 readers. What has all this got to do with me wanting to delete that blog? The blog in question had been viewed 7380 times. More than ten times as many hits as the next most viewed blog. Hmm. If you ask me, there is something very fishy going on. This very day, before I gave it the chop, it had already had nine views. Why? It was a blog written in December 2015; its subject was Claudio Ranieri, the ex Leicester City manager whose team was halfway through the campaign which saw them run out as the Premiershit Champions. It is a topic that is no longer relevant. I could be big-headed and say that it was viewed so many times because it was so well-written and obviously will be seen to be a modern literary classic. But I’m not, it isn’t and it won’t be. So just what is going on? I suspect my ill-informed blog is being used for some criminal activity. Is it being used to send secret messages? It is all very intriguing. The statistics available to me do not allow me to pinpoint who is reading what and where, but I find it very odd that thegrambler.com’s third and fourth highest readerships are the Ukraine and Russia respectively. Why on earth would someone out there be interested in my little blog? The highest readership? The good ol’ U. S. of A. Maybe secrets were being passed from east to west and back again via that Claudio Ranieri blog. So, with the click of a key, the blog has been deleted; never to be seen again. No, I hear you protest. Please don’t deny us the chance to read this piece of literature which has received such a following. Oh, you didn’t say that. Well, to placate those of you who might have protested, here is the main text from that week’s article... If you don’t want to read it, just scroll down to this week’s birthday honours and click on some links. Incidentally, it will be interesting to see if another edition of the blog suddenly starts getting high volumes of traffic. I’ll keep you posted. They are still up there. Who? What? I hear you ask. Leicester city are still up there at the top of the English Premiershit. It is great to see a team that was expected to fail spectacularly doing so well. Of course, they have some very talented players. Jamie Vardy has been mentioned before in this blog, but the whole team works so hard and well together. I particularly like the old-school defender, centre back Robert Huth. Someone who is willing to chase and stop, by whatever means, any opposition player. It's not pretty, but it's effective. Goalie Kasper Schmeichel is a great player to have in the team. He's learned well from his dad, that well known loony, Peter. However, the person who deserves most praise, in my opinion, is manager Claudio Ranieri. What a great job that man is doing. I don't know if gloating is in his nature, but he must have been feeling pretty good on Monday night after his Leicester side beat the club he used to manage, Chelsea. I do hope there is an Italian equivalent of 'get it up you' because, if I were Ranieri, I couldn't resist using it. Why? Because Chelsea owner, Harry Enfieldski, did the dirty on him years back. Ranieri was doing a good job at Chelsea at the time. He had managed to get them second in the league, the club's best finish for many a year. If he had worked for a club like Arsenal or Man United, he would have been given an improved contract as thanks for his good work. That didn't happen at Chelsea though. The following season it was common knowledge that another 'special' manager would be taking his place. Meanwhile, Ranieri had to carry on managing the team knowing that he soon wouldn't have a job. That special manager, José Moreaboutmeno, duly arrived and won prizes for the club. Who is to say that Ranieri wouldn't have done the same if he had been given the same support given to his successor? How nice to see Ranieri now rubbing his successor's metaphorical nose in the sh*t. Moreaboutmeno has managed to get Chelsea where they are today - two points away from the relegation zone. Well done you. No surprise, then, that later in the week the special one received his jotters. How ironic that having ousted Ranieri from his job 11 years ago, the tables are turned and it is Ranieri that has provided the excuse to sack the special one. I am sure Mouraboutmeno will find another club willing to take a gamble on his management skills; Manchester United has been mentioned. Meanwhile, let's all speculate on who will take over the vacant Chelsea post. It won't happen, but I would love to see Ranieri offered the job, just so that he could tell them to sticka theira job wherea the sun donna shine. Well it is that time of year again. Happy Gramblemas everyone. I hope Father Gramblemas brings you some nice pressies. There is something very strange happens to people at this time of year. The capability for rational thought seems to desert them. If I were buying a present for somebody, I would consider what they would like. I would ask myself what hobbies they pursued or what clothes they liked and give them a suitable present based on those things. Thus, any present from me is, in a word, money. Lazy b******, I hear you exclaim! Yes and no. Mrs G loves shopping, whereas I can't stand it. I give Mrs a present that allows her to indulge in a pastime she loves. Simple.Lots of people do go Gramblemas shopping, though. What could be better than shopping for presents at this time of year? Well, basically, anything. Tis the season to be jolly? Don't think so. How can anyone derive pleasure from traipsing around shops? Especially at this time of year when everyone and his dog are doing the same thing. This, I believe, is why the rational thought process goes out the window right now. Most people in those shops are doing the same thing; they are shopping for presents for friends and family. It is not a pleasant experience for even the most seasoned shopper. Everywhere is just so busy. So what happens? Instead of buying presents, they end up buying gifts. Hang on a mo, isn't that the same thing, you ask. To some, yes. To me, no. There is a distinction. A present would be, say, a nice new shirt; plain; sensible; a gift would be a shirt with a picture of Santa's feet sticking out of a chimney. A present would be a book related to the recipient's interests; a gift would be a book containing pictures of cats wearing pirate costumes. A present would be a bar of chocolate; a gift would be a bag of misshaped chocolate pieces called reindeer droppings. Do you get the picture? People who are normally quite sane and spend their money wisely, suddenly, at this time of gift giving, think nothing of splashing out a lot of their hard earned dosh on absolute tat. A hat with antlers? Ho ho. I'll take three. They'll do as pressies for somebody or other. A jumper with a snowman on it and some crude joke about snowballs? Ha ha. Gimme gimme. Uncle Harry would love that. Garish socks that play jingle bells? Hee hee. Just right for cousin Joe. Listen. These things are not funny. Admit it. They're not. They brought a smile to your face, maybe, but they really aren't funny. Before you buy this christmassy sh*te, ask yourself if you would like to receive this as a gift from someone. I would guarantee, that nobody could answer yes to that one. Now then. Consider the gift I give. Money. Ask yourself, would I like to receive money. Who is going to answer no to that one. Lazy? Maybe. Sensible? Definitely. Appreciated by the recipient? Absolutely no doubt about it. Speaking of gift giving, please consider a gift to a particular charity at this time of year. You know the one. You do. I don’t say give a huge amount. You can donate as little as two quids. Not a lot at all. Considerably cheaper than that garish jumper with Rudolph complete with flashing nose that you were considering buying. Go on. You know you want to. Just click on https://www.justgiving.com/Geraldine-Smith3 . Were any famous or notorious people born on the 26th of May? Of course, here are some I’ve even heard of. Mary of Teck 1867 (The Queen’s granny. ), Al Jolson 1886 (Non PC singer. A clip? Why not. Here he is in a 90 year old piece of film. He was one of the world’s top entertainers at that time. Ye gods and little fishes! ), Norma Talmadge 1894 (Actress. ), Paul Lukas 1894 (Actor. 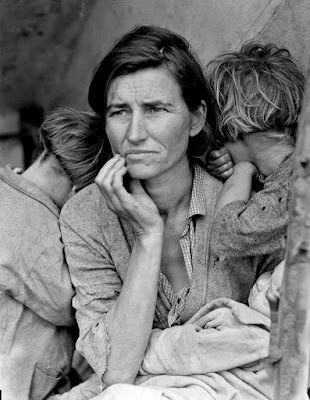 ), Dorothea Lange 1895 (Photographer. See pic below. ), George Formby 1904 (Singer. Another clip? Here you go; another bit of film, this one's only 77 years old. He was Britain’s highest paid entertainer. Ye gods and little fishes! ), John Wayne 1907 (Actor, it says here. ), Robert Morley 1908 (Ectaw. ), Matt Busby 1909 (Footy bloke. He was manager of Manchester United for 24 years. ), Jay Silverheels 1912 (Actor. Tonto: that was him. ), Peter Cushing 1912 (Ectaw. ), Peggy Lee 1920 (Singer. You would like another clip? Go on, then. All together now... Never know how much I love you...), James Arness 1923 (Actor. Played Marshall Matt Dillon in Gunsmoke for 20 years. ), Roy Dotrice 1923 (Ectaw. Karen and Michelle’s dad. ), Alec McCowen 1925 (Ectaw. ), Miles Davis 1926 (Musician. A clip? Have some jehhhzzz. So what. ), Cliff Drysdale 1941 (tennisy bloke. ), Mick Ronson 1946 (Musician. Time for another clip, methinks. Here he is performing the Shadows’ FBI followed by Richard Rodgers’ haunting Slaughter on 10th Avenue. ), Stevie Nicks 1948 (Singer/songwriter. A bit of Fleetwood Mac. Here’s Dreams. ), Jeremy Corbyn 1949 (Politician. ), Michael Portillo 1953 (Ex-politician. Now spends a lot of his time on trains. ), Colin Vearncombe aka Black 1962 (Musician. Had one enormous hit and here it is. ), Mary Nightingale 1963 (TV presenter. ), Lenny Kravitz 1964 (Musician. Let’s have another clip. Did you realise this was a religious song? ), Hazel Irvine 1965 (TV presenter. ), Helena Bonham Carter 1965 (Ectress. Mother Squirrel. ), Lauryn Hill 1975 (A Fugee. Here’s an early hit. ), Paul Collingwood 1976 (Crickety bloke.) and Jason Manford 1981 (Comedian.). We are absolutely disgusted that you included a clip in your disgusting little blog of that disgusting little man, George Formby. All his songs were disgusting. My little stick of Blackpool rock? Disgusting! I like to have a nibble at it now and again! Absolute filth! We know exactly what he means. Mind you, it’s a good trick if you can do it. There was just one song he did that wasn’t rude in any way. It was his signature tune, but neither of us can remember what it was called. Can you help? PS. And his grills are rubbish. Let’s move onto grambling matters. How did last week’s bet fare? Badly. How much did it win? Zero. Zilch and other such words that mean nothing. Oh well, let’s have another try. Grambler... do your worst. The selections have been made. Let’s see how much we could win in the unlikely event that the results go as predicted. Ah, we’re back in normal, barely whopping territory after last week’s off the wall predictions. Teaser time. Yay! Last week I asked you who was the manager of Livingston when the club won the League Cup against Hibs. The answer was former Celtic and Chelsea midfielder (and former Motherwell manager), Davie Hay. Incidentally, before we move on to this week’s teaser, I would like to congratulate Livingston on their return to the Scottish top division after winning the promotion/relegation playoffs. Now, one for this week. Alex Ferguson is rightfully acknowledged to be the most successful manager there has ever been in English football having won all three domestic competitions - 13 league titles, five FA Cups and 4 League Cups, but who is the next most successful manager to have won all the domestic trophies? One to try out down the pub. And finally, Cyril? And finally, Esther, I am indebted to a Mr. R. Webb whose antics ended the blog that was deleted. It really is a rather good parody of Flashhdance and I wouldn’t want you to miss out on the chance to see it. So, Ladeez and gennulum, in an unprecedented (That's a good word; must look it up.) move, The Grambler suffers from a repeat of What a Feeling.